This is a brief description of the service. During the office visit the first procedure what we provide is a scan of the body/s functional parameters using Meridian Stress Analysis (MSA). Our facility is one of the few in Texas that offers MSA. According to Chinese medicine, the meridians are a system of pathways that carry the life energy or "chi." This energy can be measured electrically at points along the meridians which are much more electrically conductive than the surrounding tissue. The Meridian system is like a blueprint that the body builds itself on. All of the biochemical processes of the body are run by the energy system, and if the blueprint is incorrect, the processes do not flow properly. This affects the cells, which in turn affect the tissues and results in symptoms, illness and disease. 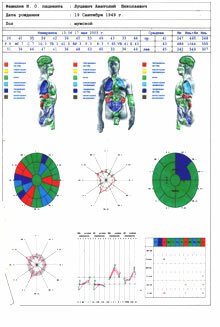 Using the Meridian Stress Assessment (MSA), one can test the various meridians of the body using a non-ionizing, non-thermal, frequency specific signal to determine which systems of the body are stressed, balanced or weakened. Once the meridian measurements are obtained, the MSA is used to balance the energy on that pathway. The MSA is FDA registered as a Galvanic Skin Response Device whose function is Stress Assessment. These registrations are indicative of a commitment to the safety and wellbeing of both the client and practitioner. Testing the meridians using the MSA involves touching different meridian points on the hands and feet. MSA testing is a non-invasive way to obtain measurements because there are no needles that pierce the skin. The MSA does provide valuable information, but does not diagnose disease. Once organ is identified as unbalanced the client’s body will receive all essential Information for its balancing using one of two options: holding in hand information module (IM) for 1 hour or laying down under a pyramid for 30 or 60 minutes. The Information Module (IM) is a set of crystals, magnets, and a small vial of water. IM comprised the healing information. After previous procedure client has a second MSA which reports responding body to treatment and this information is transmitted to the individual Rigid Information Carrier (RIC). RIC is a slice of a tin and attaches by sticking-adhesive just below the middle right collarbone. Information from the RIC reads out through the blood and lymph system and transmits through the organism to make all the necessary changes in the organs, systems and even cells. 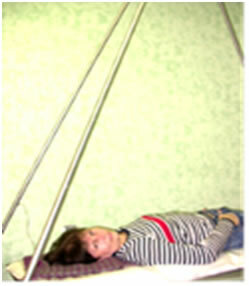 Each RIC system contains one month of treatment. We recommended visiting our office one time a month repeatedly. A result is seen in gradual changes in the symptoms and for most clients it takes at least one year. Healing can be verified through computer diagnostics and positive changes in homeostasis of an organism.